The mission of the Scholarship is to foster the professional apartment industry education and career development potential of selected up-and-coming multi-family rental housing industry leaders in North Carolina. The scholarship will pay up to $1000 of the cost of the NAAEI Designation course. Any additional money owed would be the responsibility of the applicant. ​It is named after long-time North Carolina apartment leader, Larry Cranford. Larry was loved by many for his folksy ways, his absolute commitment to industry education, and his people skills. Larry taught apartment management and maintenance throughout North Carolina for some 25 years. Larry was the AANC President from 1996-1998. Congratulations to the 2018 Larry Cranford Memorial Scholarship Recipient, Katelin Denkins. 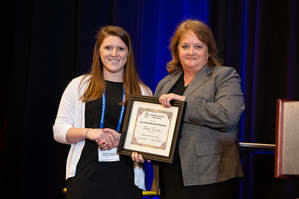 Katelin received the scholarship during the 2018 AANC Education & Legislative Conference in Raleigh, NC. She is pictured here receiving the scholarship from AANC Vice President, Sherry Yarborough.